Yet for those times you can’t make Mass, or can’t take Communion because of an unconfessed mortal sin (for which you can ask for and receive God’s forgiveness in the Sacrament of Penance), you can still reach out to Him by making a Spiritual Communion in prayer! You can receive the Lord in Holy Communion up to twice a day as discussed here. However, you can make a Spiritual Communion as whenever and wherever you'd like, using the prayer given above, others like it such as the one below, or your own heartfelt thoughts. It is an important part of Church teaching that the consecrated bread (in the form of wafers we call hosts) becomes what is known as the Blessed Sacrament, referred to in St. Alphonsus’s prayer above. Those hosts not used in Holy Communion at Mass are placed in a special box known as the Tabernacle to be given out later to the sick or the dying who cannot attend Mass, and to be exposed otherwise for adoration in what is known as the Rite of Eucharistic Exposition and Benediction. 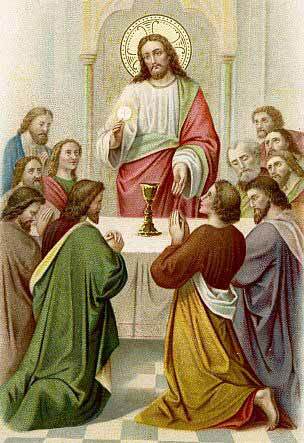 You can make a Spiritual Communion such as this one below during Mass, or before our Lord in the Blessed Sacrament, or anywhere else where the Spirit moves you. Oh Jesus, I turn toward the holy tabernacle where You live hidden for love of me. I love you, O my God. I cannot receive you in Holy Communion. Come, nevertheless, and visit me with Your grace. Come spiritually into my heart. Purify it. Sanctify it. Render it like unto Your own. Amen. This last sentence is drawn from Matthew’s Gospel (Matt 8:6), in which a Roman Centurion expressed his deep faith in our Lord’s healing powers (in this case to cure his servant rather than his soul). Jesus was quite moved by the soldier’s faith, and healed his servant at once. Christ might not answer us quite so instantaneously, but rest assured, He can and will respond to anyone who comes to Him in love and humility for His Divine assistance. After all, didn’t he say in the Sermon on the Mount, concerning the power of prayer, “Ask, and it shall be given you: seek, and you shall find” (Matt 7:7)? Indeed, our Lord loves each of us so much that he gives us great opportunities to be with Him on a daily basis. If the Pope came to your parish, you’d probably have to elbow your way through crowds of people to catch a glimpse of him. And yet, think of it! You can have your own private “audience” with Christ at Mass in Holy Communion or in Spiritual Communion in front of the Blessed Sacrament! Countless Saints and theologians throughout the centuries have extolled the virtues and great spiritual benefits we can receive from this time spent with our Lord. Remember, however, that you can “turn toward the holy tabernacle” and receive Jesus in your heart from anywhere you might happen to be, at any time, day or night! St. Jean-Marie Vianney, a French priest famous for converting countless souls to Christ in his parish of Ars in the 19th century, once said “when we feel the love of God growing cold, let us instantly make a Spiritual Communion. When we cannot go to the church, let us turn towards the tabernacle; no wall can shut us out from the good God.” We can indeed be grateful for that!